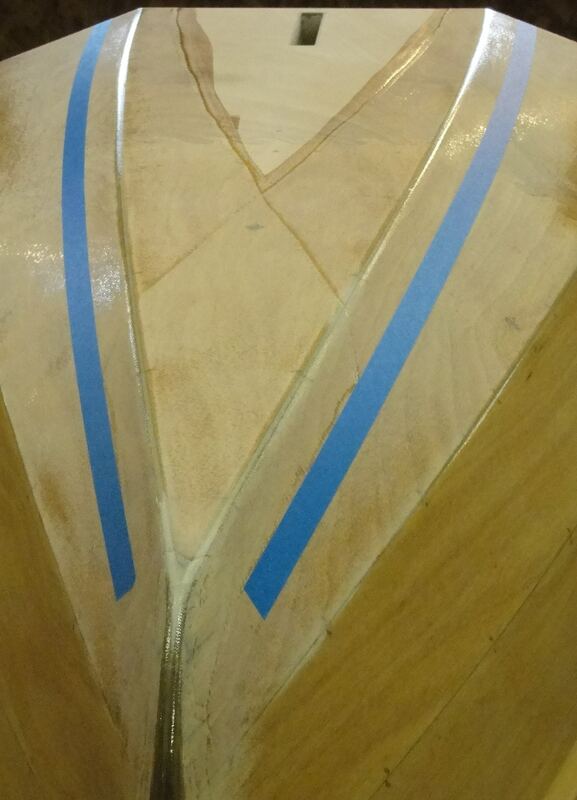 Back tracking a little, the skeg got glued on after glassing but before gloss coating the hull. 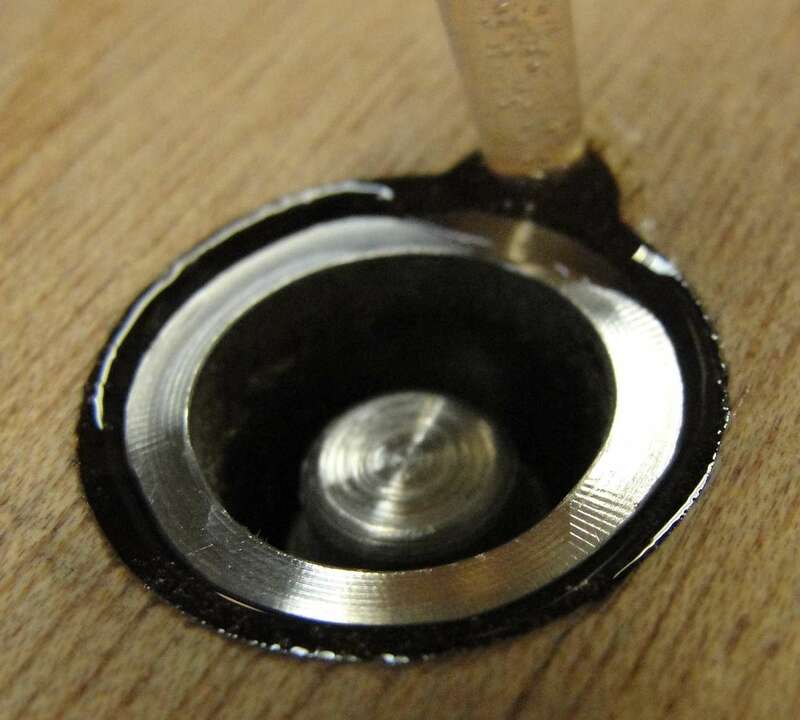 Installing the skeg is made easy with tongues and slots. 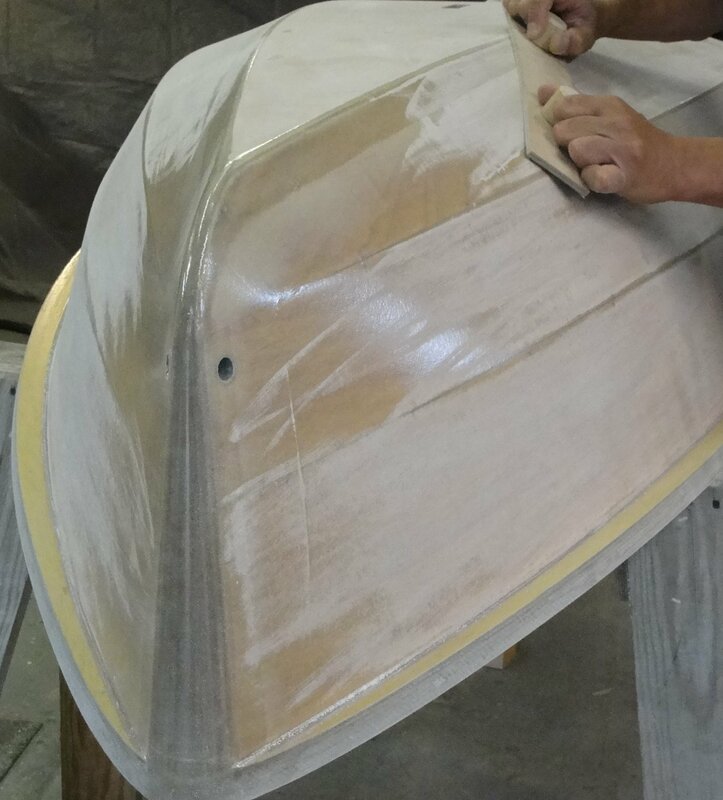 Showing the skeg after the hull has been glassed and gloss coated. 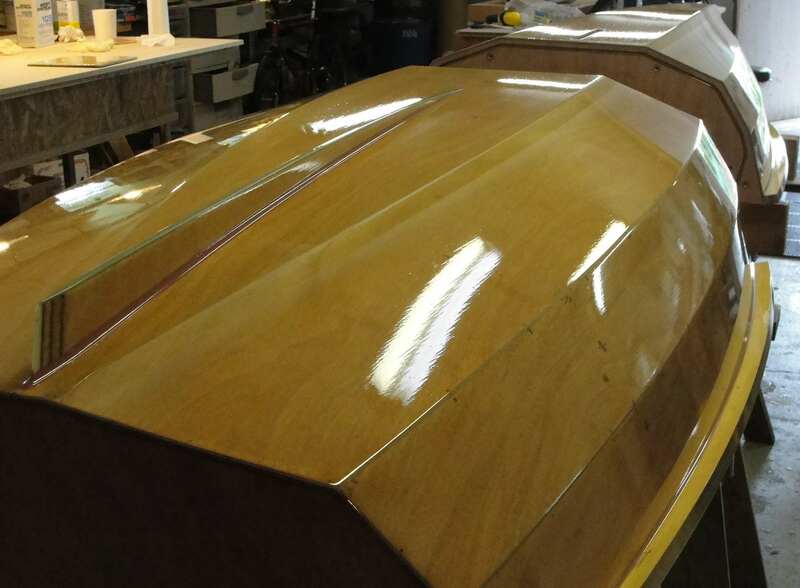 Russell and I want to let everyone know that we are much closer to having the PT Eleven nesting dinghy done. 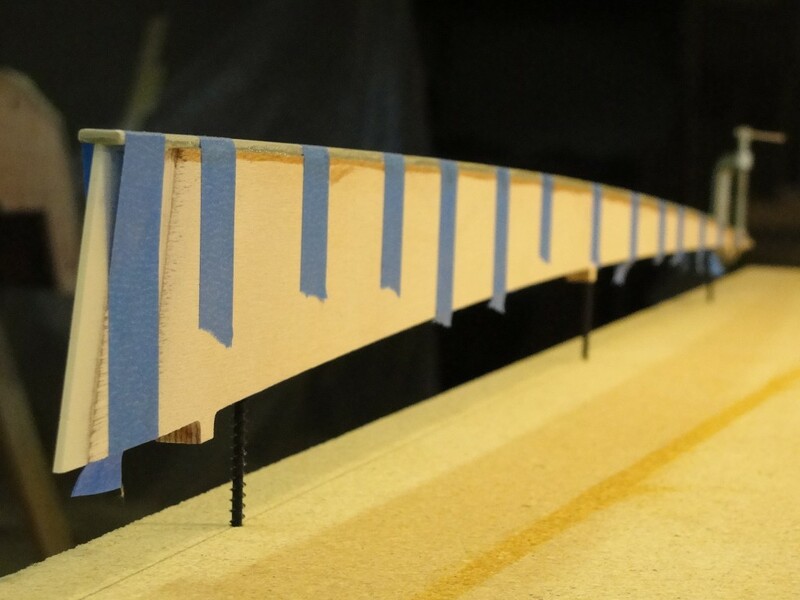 The final prototype is very close to completion. 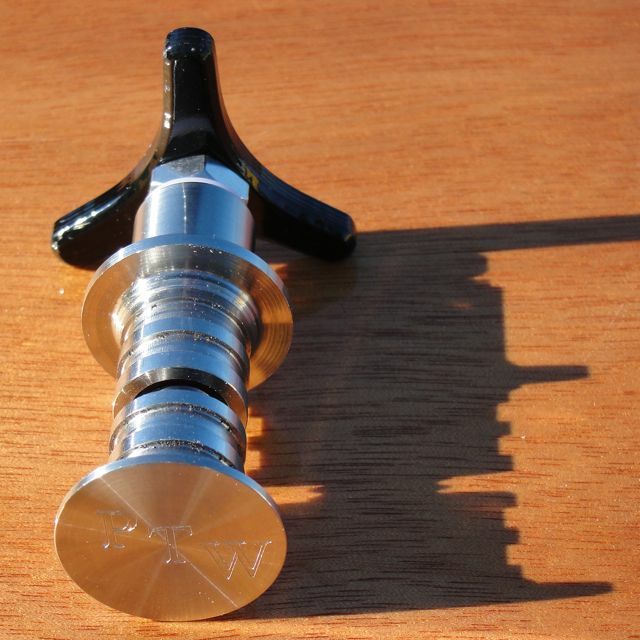 All the hardware (some recently posted on the blog) and most parts of the kit have been developed for production. Writing the manual is progressing daily and formatting it is not far behind. 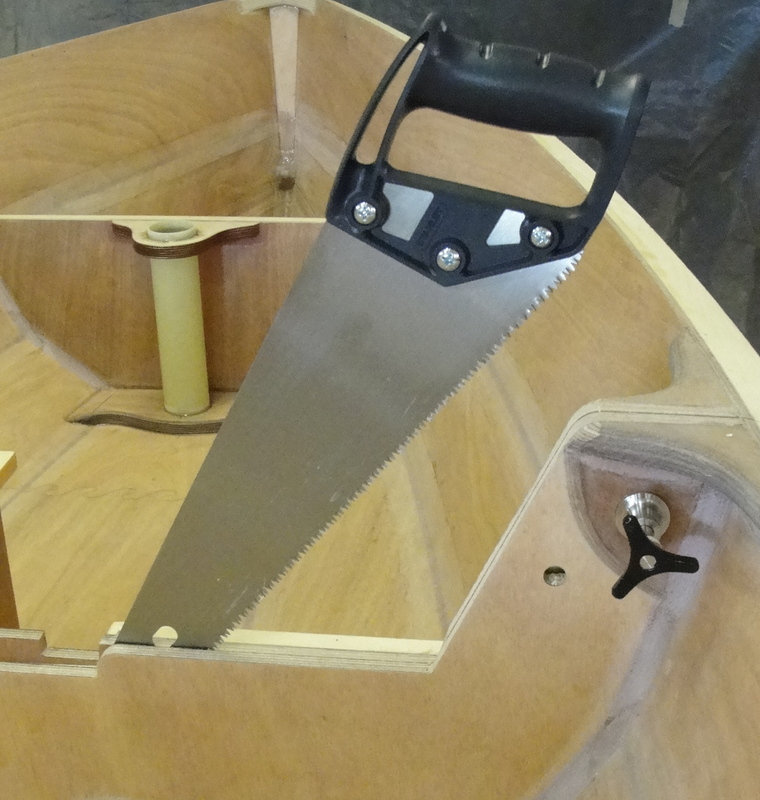 We will be able to cut kits for the PT Eleven after we finish this boat and the manual. We are aware that it has been a long wait for some of you and you may have moved on to other ideas. 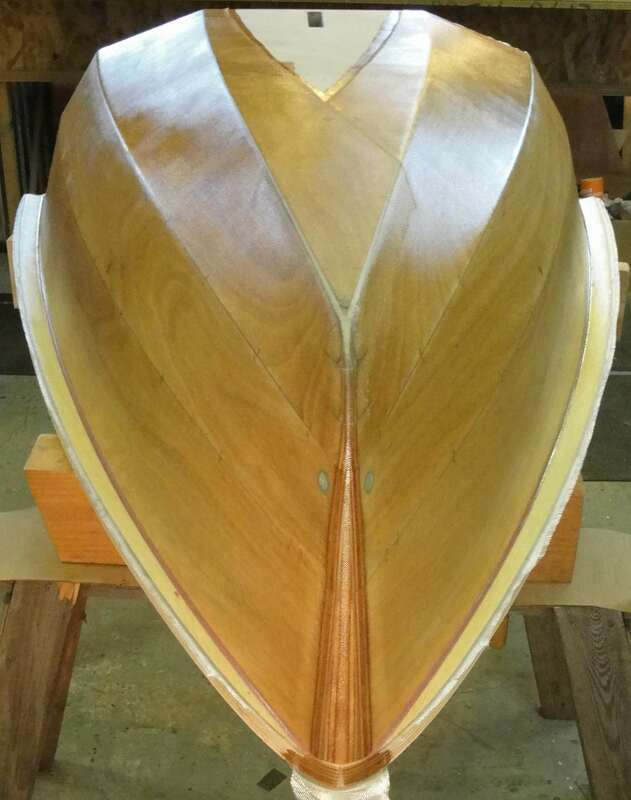 We have had some pretty impressive charachters view this boat and their critiques have been extremely positive. 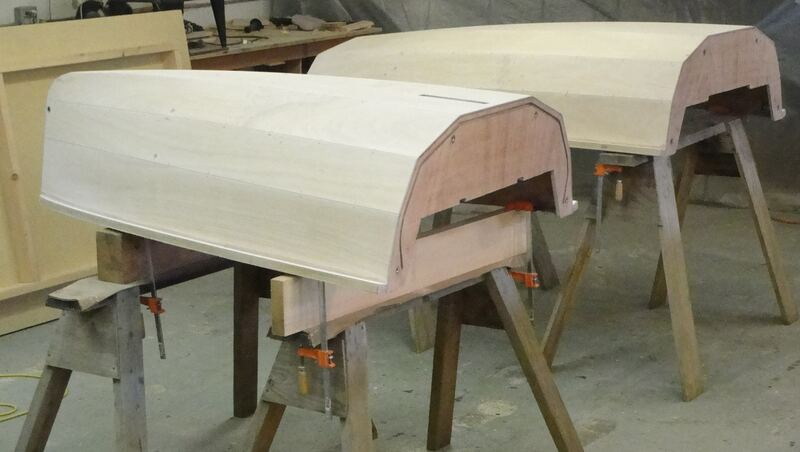 The PT Eleven is a very highly developed kit boat and will be complete before putting it on the market. Pricing update: We still think we can sell this kit for $1,500.00 including the glass kit. 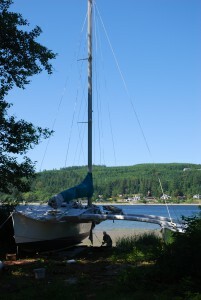 We are working on a very well developed sailing rig. 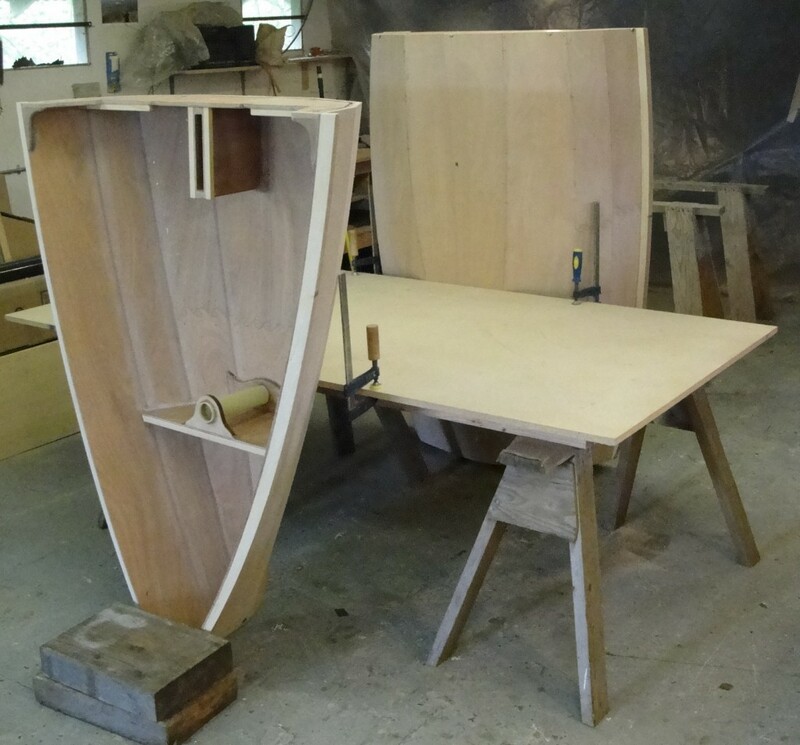 The foils (daggerboard & kick-up rudder) are CNC cut from Okoume plywood and finished by the builder. 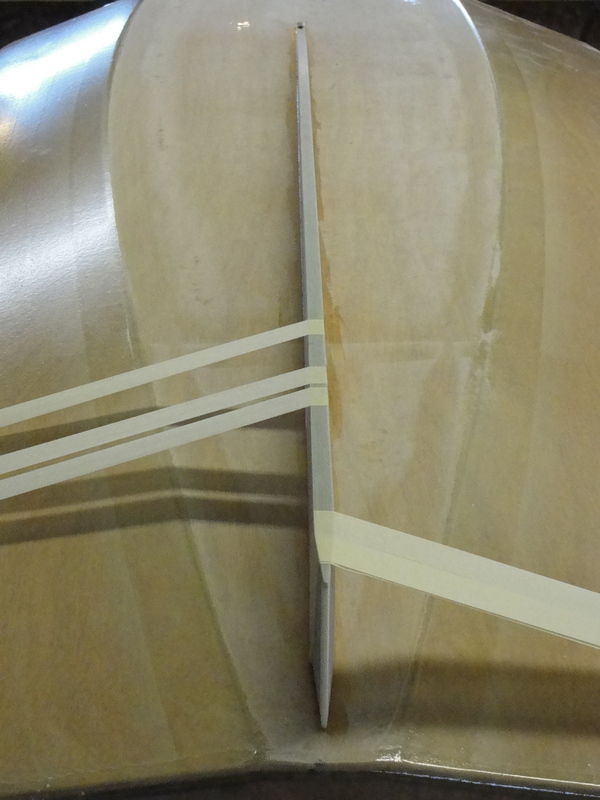 The mast is a 2 piece tapered carbon tube that fits into a sleeve in the hull. The boom is a tapered carbon tube as well. 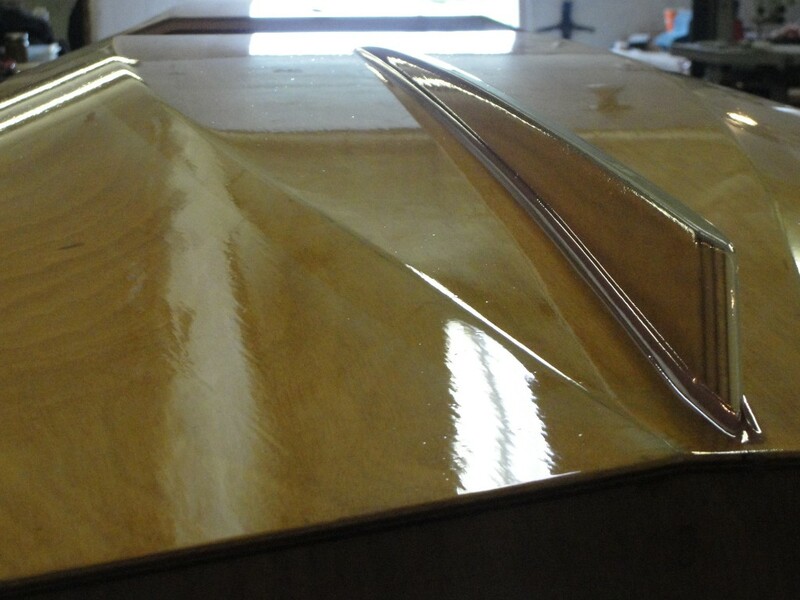 The sail is a smaller version of the one in the videos, about 60 square feet. The design is complete and beng made locally. Prices for these will be announced. We apologize to those who have been waiting for awhile. This has been a far more involved process than we expected, but we believe that the extra time spent has been time well spent. This show model of the PT ELeven, as well as the PT SKiff will be at the Port Townsend Wooden Boat Festival on the weekend of September 9-11. 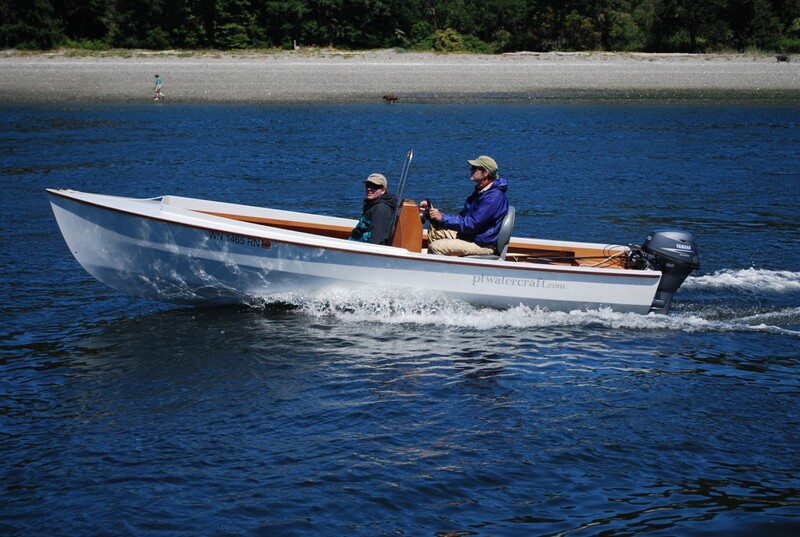 Port Townsend Watercraft will have a booth with Gougeon/West System Epoxy. Feedback and questions are welcome. If those of you who plan to buy a PT Eleven kit this year would like to reply and let us know, it would help us a lot in our scheduling. 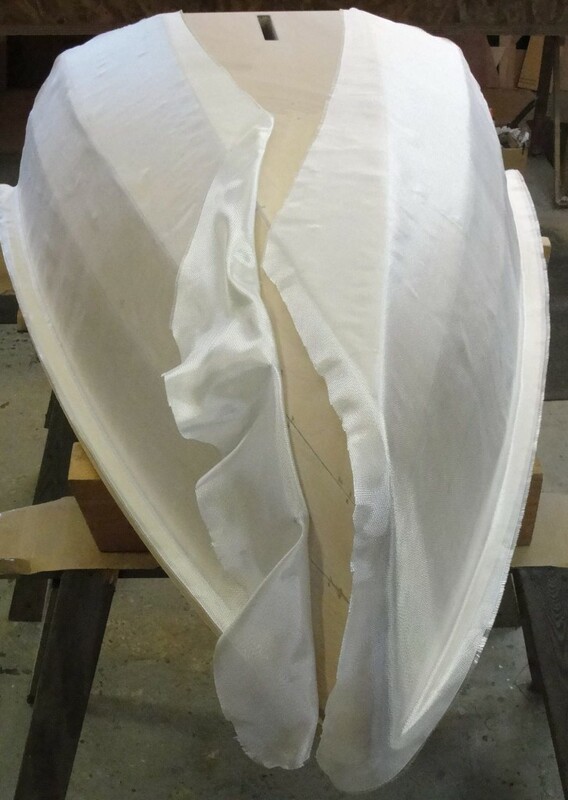 the hull bottom and transom are glassed separately, the botom glassed with much heavier cloth. This month saw the launch of our proa, Jzerro. 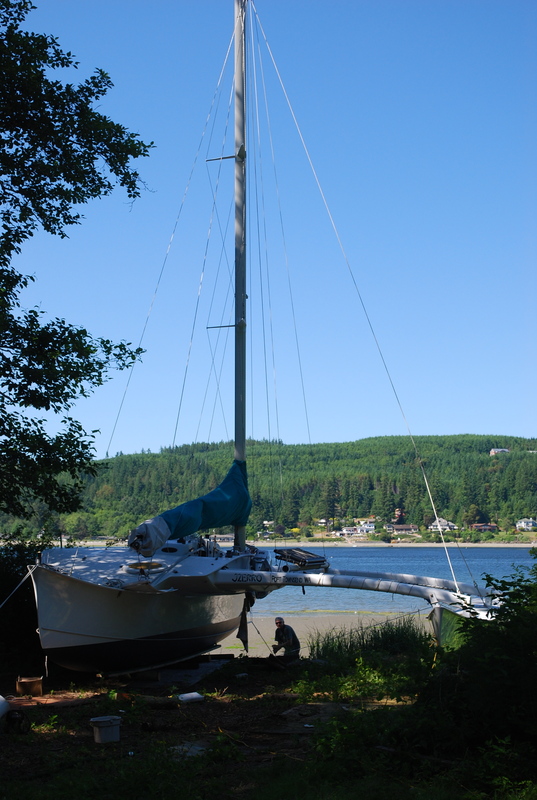 She had been pulled up onto a bank in a friend’s yard on the Hood Canal for more than a year. With a ‘come-along’, logs for rollers and skids, Russell got her onto the beach just in time for the tide to float her. A couple days later, we picked her up with friends, Bly and Abel, in the PT Skiff and passed under the bridge and onward for a great sail to her new mooring. The day began in thick fog but ended in beautiful sunshine and gusty winds. 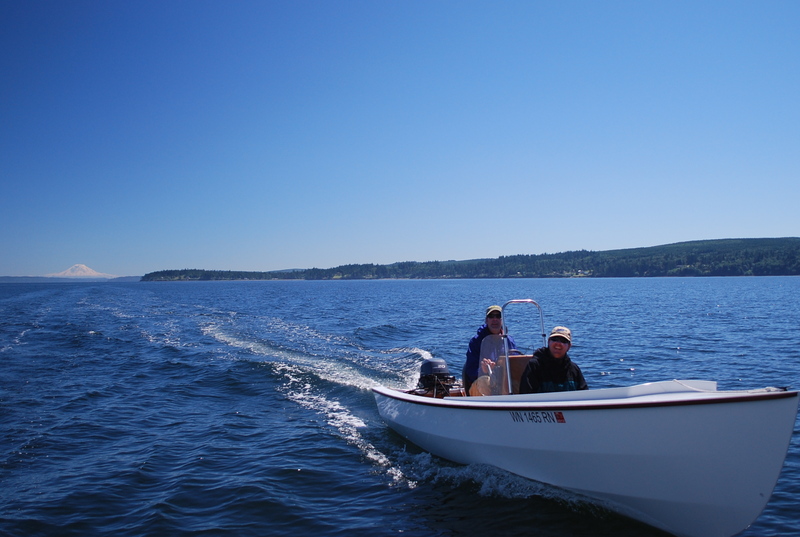 Bly captained the skiff and had some adventures of his own, exploring both sides of Puget Sound and discovering what the skiff can do in 20knots of wind. By the end of the day, we were happy to hear we had a new fan of the boat. 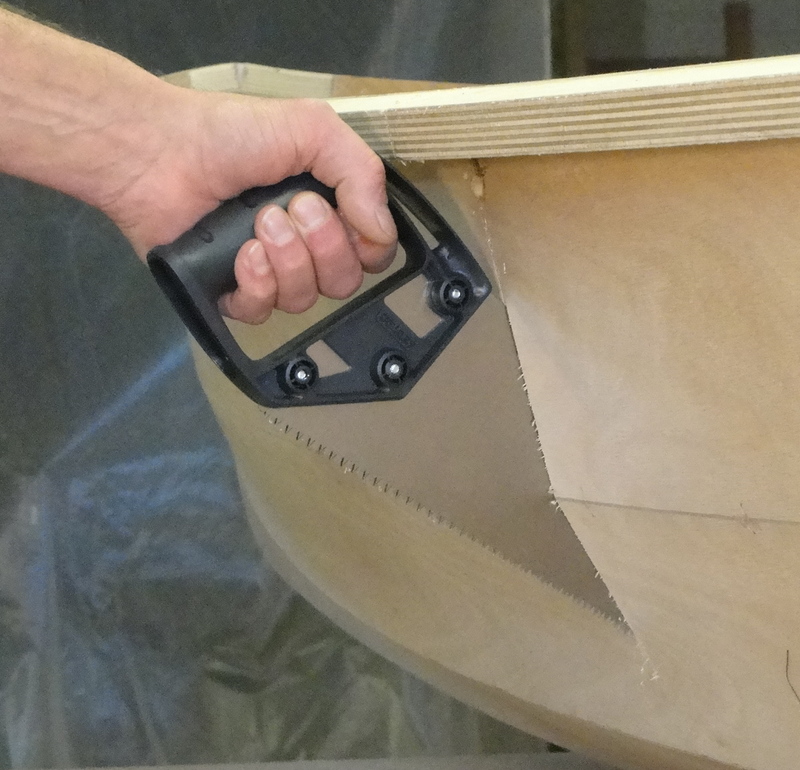 PT Eleven; cutting the boat in half.. The hull halves are stood on end so that gravity can do it’s thing when injecting the sockets around the hardware. June was a month of distractions, delays and details that slowed progress on the the nesting dinghy. 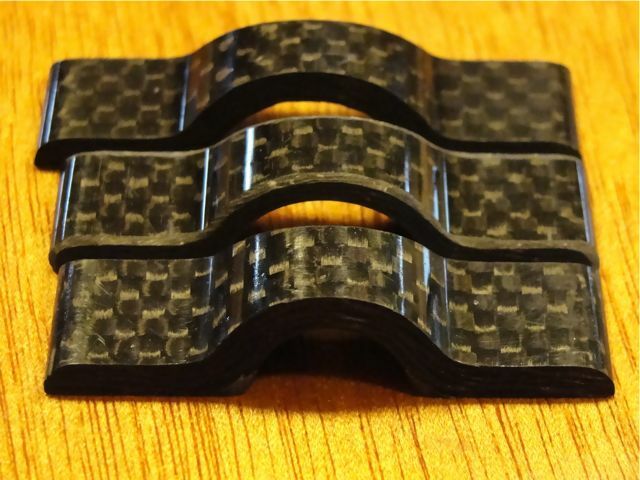 One of those distractions was a turning point in our carbon eyestrap production. Demand for these little hand crafted eyestraps has increased. This is good news! However; our previous production method was not meeting demand effectively. 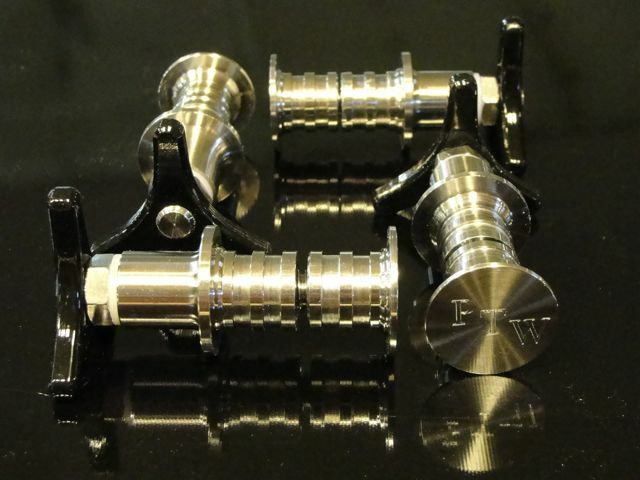 It became evident that we needed to improve our production method quickly so we settled on a new design and we had a mold mold CNC machined. We combined the “long” and “short” sizes into one size for the single eyestrap. 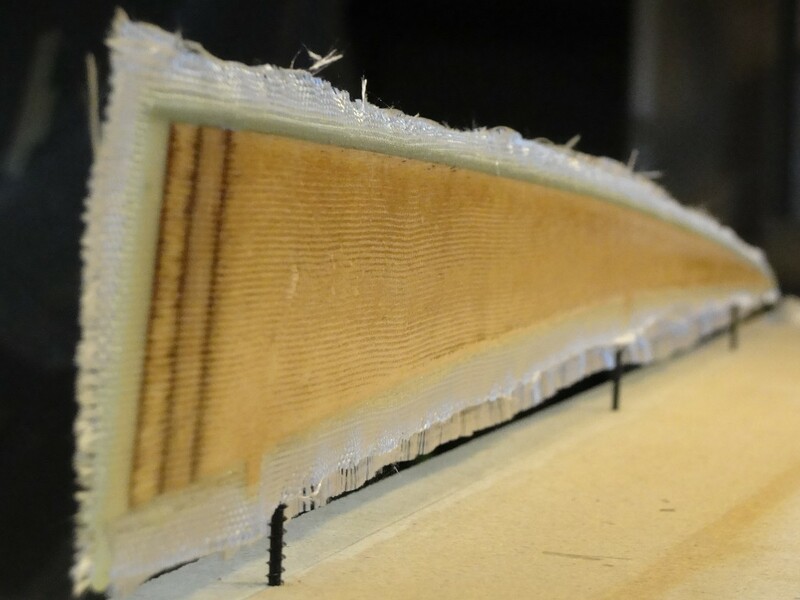 This size can still hold 2 lines or bungee of up to 1/4inch diam. The following photo shows cross sections of all three designs and the next photo shows a top view comparison. From now on, we will only carry the new size and they can be ordered via the order form on our website or send us an email. 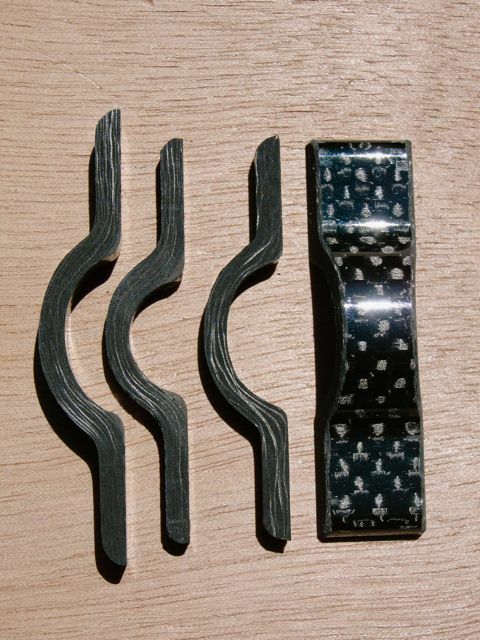 From far left: long eyestrap, short eyestrap, the new single eyestrap. From top to bottom; long eyestrap, new single, short eyestrap. 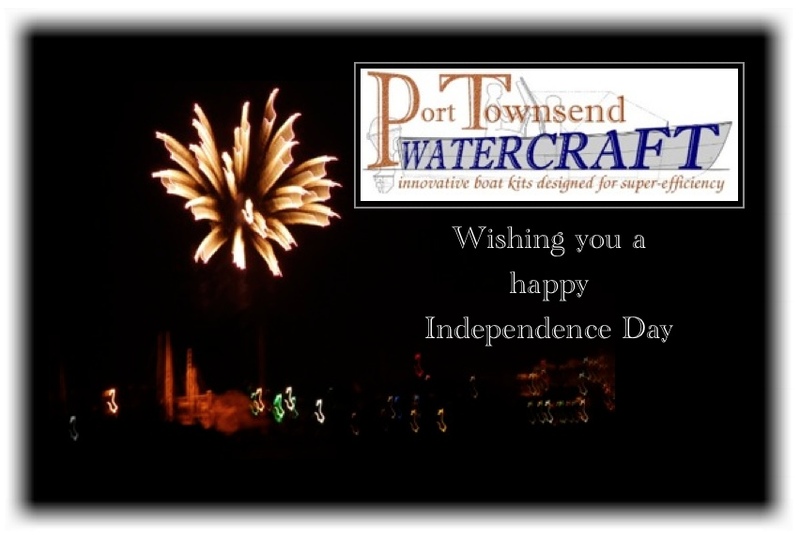 We hope you are enjoying a free day doing whatever makes you happy!